NGD: MIJ Fender J Mascis Jazzmaster! Had a bit of a blackout and ended up purchasing a proper MIJ J. Mascis JM. I have ideas for a few small mods, but it plays super nice already! I’d love to switch out the wiring and the pickups, but the first question I have is... does the Fender JMJM take a US or MIJ pickguard? I assume it’s MIJ but a quick overlay of a US guard I have here it seems like it’d line up? It’s a bit bright, but the tone controls are actually useable, so I can dial in a sound I like, so the electrics are not my number one priority just yet. Heh. 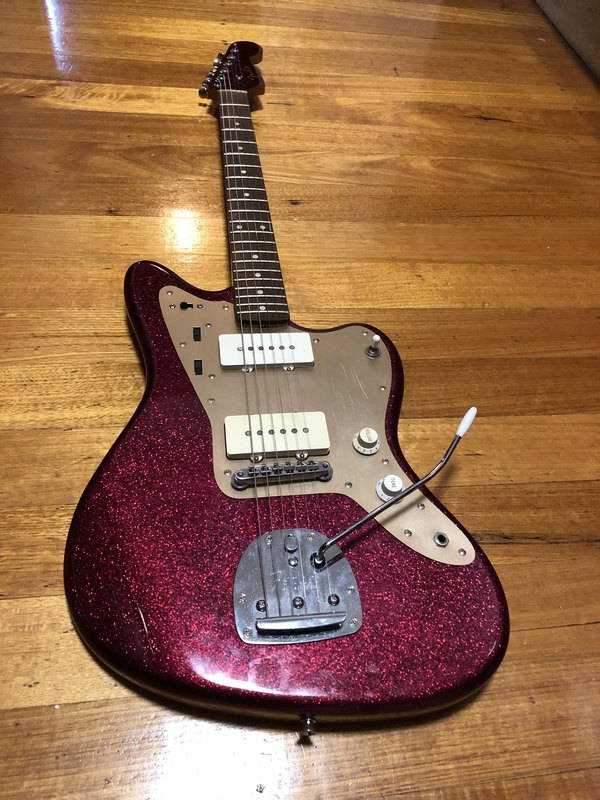 Re: NGD: MIJ Fender J Mascis Jazzmaster! After several years, I sold mine on to a gent in Sweden. I really like the necks on these and the finish is lovely. I felt lukewarm about everything else! The electronics are nothing special. The JP hardware (especially the vibrato) isn't up to par with the American stuff. The pickguard is a funky color of gold that is unique to the JP JMs. I also grew to dislike TOM bridges due to their non-conformity with the neck radius. My current Framus Strato suffers this and I'm selling that one off too. The JPJMJMs' potentiometer are also very light to the touch. Still, I really liked the guitar and was very hesitant to sell it. It was too rare and pretty to take to gigs and the sounds that came from it are readily available elsewhere in my arsenal. Mine did take to a good setup rather well and was solid in that regard. If you are angling toward turning it into a 'better' JM, then I'd swap out the pickups for something that you like as a first and primary measure. Gut it and keep the guard. I do believe that the JP guards have different screw holes than the other units. I can't verify that at the moment though. It is something to check into. Next would be the vibrato and bridge unit. I have always wanted one like that. It takes a Japanese pickguard. However check it first because the TOM holes are drilled like a Gibson one VS typical Fender. One is slightly closer to the headstock to give it an angle. A new pickguard might not have the holes match up right and it isn't drilled straight across like a Classic player. Nice one, always wanted some sparkle JM action. Thanks for the info. I guess the MIJ pick guard bridge post holes need to be big enough to accommodate. I still itch for one of these. Maybe my favourite finish ... but, too many guitars at the moment. Enjoy! I used the Squier version with Novak pickups and vintage wiring and it sounded awesome, so would back your idea of doing the same on this! Still have it, though since moved the innards into a CIJ Burgundy Mist as couldn’t find a purple Mascis. Can I be cheeky and ask how much you paid? Definitely feel free to say no! I saw Gas Station Guitars has one in this week but were asking £1395 which seemed very high (although it’s sold already so maybe not). I sold mine for 1150€ including shipping from Austria to Sweden. I included a cheap gig bag for protection and it was in 9/10 condition. The transaction occurred in April 2018. Beautiful guitar. I have always loved that finish. I've always wanted one of these. It's so awesome. Congrats! I think I got a pretty good deal... $1400AUD. So about $987USD give or take. It even included a hard case. Weird, I feel like I’m on everyone’s ‘ignore list’. I’ve posted data and opinion without a word of acknowledgment. I’m not big on attention seeking but still, Community. Social dynamics have always interested me. I know I didn’t say anything, but I really appreciated your post!